With Christmas right around the corner, chicken hobbyists and those dreaming of acquiring chickens in the spring are making their lists and checking them twice. Of course, on the top of every chicken lover’s list is poultry-themed pajamas and the newest egg sorter. However, many chicken keepers reserve their Christmas wish list for that big-ticket item. A new chicken coop. The big details obviously consist of designing the size to fit your proposed flock (with some room to grow), making sure your future coop will keep your chickens safe from predators, and figuring out the placement of roosts and nest boxes. These details are important to your flock, but it is the smaller details that may end up being very important to you. Let’s start with people doors. Once you’ve knocked your head on the door frame a time or two, or you realize your favorite muck bucket is too wide to fit through the opening, people doors will become an important detail to you. Make sure that your door opening will accommodate you and the tools you intend to use when caring for your flock. Another consideration when designing your people door is assuring that you won’t lock yourself inside the coop. After army-crawling through a pop door, this small detail will become startlingly important to you. After my own army-crawl of shame, I installed a gate latch that can be disengaged from inside the coop. A final thought on doors is designing your people door to serve a purpose beyond letting people in and out. Such a large opening has great potential for ventilating the coop. It may be wise to consider adding a screen door or dutch-style door that is divided in half to increase airflow on warm days while maintaining safety. My coop was constructed with french doors with a screen insert one side. I can open that entire area when we’re having beautiful sunny days and the girls seem to enjoy sunning themselves. Along the lines of ventilation, standard eave vents are good, but adjustable ventilation is even better. Remember, ventilation is an important design feature for your coop all year long. Windows that can be slid open from top or bottom are wonderful for adjusting air flow. Attention to weather-proofing is a must to keep elements out and comfort in. Upper wall vents with wooden awnings or shutters keep rain out and allow you to open or close the opening depending on the outdoor temperatures or weather conditions. Being able to customize your ventilation allows you to control ventilation for all four seasons. Another seasonal consideration is the weather during spring, summer, fall, and winter. Do the winter winds blow where you propose to locate your pop door? Will the summer sun blaze through the windows and into the nest boxes, which will discourage laying? Are the spring rains going to run off the roof causing a muddy mess outside of the coop’s entrance? Think about all seasons when you are designing. Please note, ventilation during the winter is so important. I share Lesa Wilke’s post on winter ventilation on social media every year and I’m sharing it with you now as well. After reading all the recommendations online, you may think you’ve figured out the perfect number of nest boxes for your flock. You can design and install permanent and stationary nest boxes to collect your eggs. That seems like a sound idea, but what if all of your hens only use one box? That is a lot of wasted real estate in the coop. There are a few ideas you might want to consider when you design your nest boxes. First, think about using individual wall-mounted nest boxes. They can be moved or removed with just a few screws. They also free up floor space, which is handy if your birds spend a lot of time in the coop. Another great idea is to make at least one nest box a communal box. Communal boxes are two to three times wider than traditional boxes. They are great for accommodating several hens that want to lay in the same box, work great for housing broody hens and their chicks, and can be repurposed as feed and supply cabinets if the hens do not use them. I’m also a huge fan of bucket nest boxes. I use them in the run for the ladies that prefer to lay outside of the coop. Don’t miss out on my roundup of awesome free (or cheap) upcycled nest boxes. You probably have most of the supplies on hand already. A final thought when it comes to creating your Christmas coop wish list is a proper feed station. Sure, you can hang a standard feeder in an available corner, but you can design for so much more. Chickens are known to waste food. They are really messy creatures. Pellets tend to go flying all over the place and it seems like you are refilling the feeder constantly, even with a small flock. I converted an old garbage can into a feeder using PVC elbows. It holds 50lbs of feed. If you are building a coop from scratch, now is the time to think about building a feeder that fits inside the wall space, between the joists. This frees up more space inside the coop and it can be made to accommodate a 25lb bag of feed. You may also want to consider a “catch” built under the feed station so that pellets are dropped into a removable container and recycled back into the feeder. A feed catch can save you anywhere from $1 to more than $10 a month, depending on the size of your flock. So make your list and check it twice. 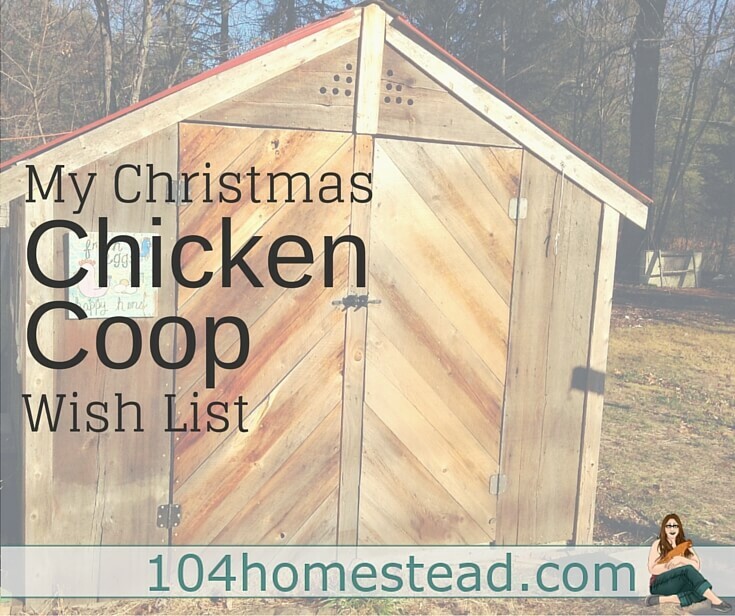 If you’re going to ask Santa for a chicken coop, make sure it’s a coop that is sure to please you and your flock. For more poultry tips, subscribe to The Homestead Helper. I’ll send you tricks for raising backyard chickens as well as other information for homesteading where you live. Don’t miss ⇒ The ultimate guide to raising laying hens. I am a non-traditional homesteader. What is a non-traditional homesteader? I'd like to think we are the people who don't fit the mold. I am a busy mom on a small bit of property with not a lot of financial resources, but I am figuring out how to live the life I want. A homesteader's life. My chickens are messy when it comes to their food. I think they waste half of it. Well not really waste it, but kick it everywhere. I need to come up with a good chicken feeder plan that reduces the mess and keeps their food dry. I also need to do something similar with water also. I had good luck creating a catch which is basically a box in the ground with a hardware cloth lid. When food reserves are getting low, I open the top and scoop out the spilled feed. is Jessica Lane. I live a nearly self-sufficient lifestyle with my three beautiful children on 5 1/2 acres in Maine. We raise Nigerian Dwarf goats, ducks, and chickens, and we grow as much food as we can. What we can't grow or produce ourselves we barter for. If we can homestead where we live, what's stopping you? I am not a doctor, lawyer, veterinarian or Martha Stewart. Please use the knowledge acquired from this site responsibly.